In a large mixing bowl add the lamb, crumbled feta, lemon zest, chopped apricots, cumin, coriander, egg, salt and pepper and work really well into the meat to create a well-combined mixture. Shape and pop in the fridge until you want to cook them. Lay the cucumber flat onto a chopping board and peel lengthways along the cucumber with a speed peeler to create long thin ribbon. Set aside. Combine the tahini, yogurt, juice of a lemon, sumac, garlic, salt and pepper to a bowl and fully combine. You can cook your koftas on a BBQ, under a grill or fry in a pan. Any of these options do not require oil for cooking. Cook the koftas till cooked though but keep an eye on them turning them frequently as they colour quickly. Heat a griddle (or a BBQ if you’re using one) until smoking and place the flatbreads onto the griddle. Heat to create char marks for extra flavour and to have hot flatbreads. 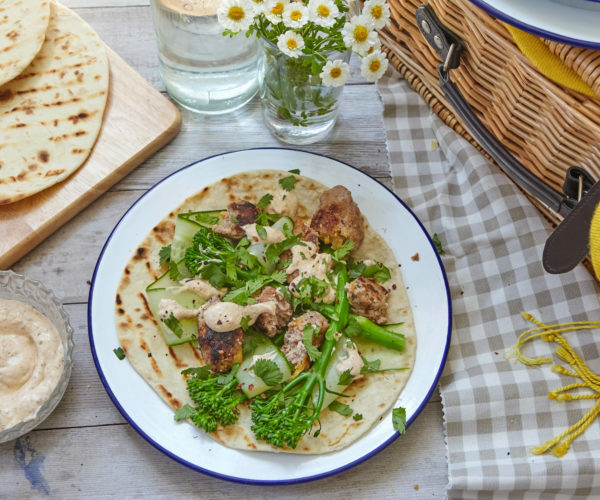 Assemble your koftas onto flatbreads with the cucumber ribbons, Tenderstem®, koftas, tahini sauce and chopped coriander.